Full written paper will be available by mid-June. A feature of sociological practice is to continually record experiences and observations so as to sustain the ‘sociological imagination’. As Mills (1959) famously instructs, sociologists should ‘start a file’ to capture these observations, fringe thoughts or snippets of conversation. So it is, perhaps, in these files that the ‘traces’ of previous generations of sociologists are to be found. For any researcher seeking to understand the disciplinary contribution of those who have gone before the analytical and explanatory potential of such notebooks and personal research ephemera is immense. However, such materials are not easy to find as they are rarely formally archived but, instead, are retained by the individual researcher or their estate. Considering these issues, in this paper we focus on three aspects of our research into the life and work of Pearl Jephcott (1900-1980). 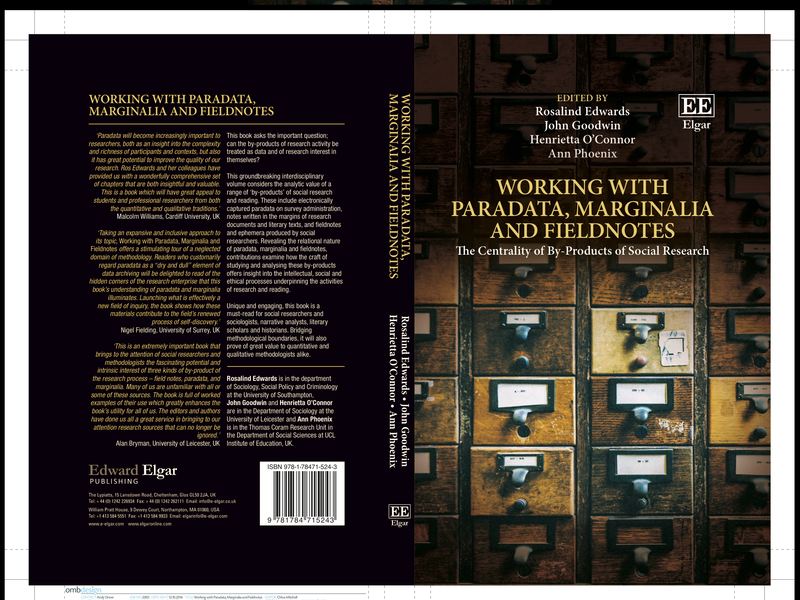 First, we outline our journey of ‘tracing the traces’ of Pearl and our quest to discover as much as we could about this forgotten sociologist. A journey which took us via the various ‘formal’ archives linked to Pearl’s work and on to the genealogical work of Goodwin (2015) who managed to locate Pearl’s relatives – dispersed family members who had fortuitously retained the remnants of Pearl’s personal research archive. Second, we contrast the formally deposited archived materials relating to Pearl’s research with the personal research notebooks and ephemera unearthed via the trace. 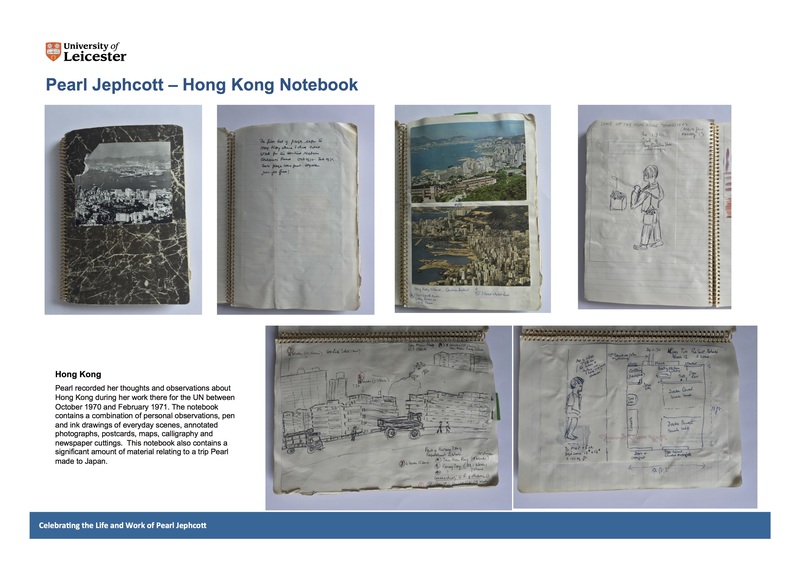 Finally, we present and explore Pearl’s ‘sociological craft’ by focusing on one notebook she collated during her trip to Australia in 1971 aged 71. 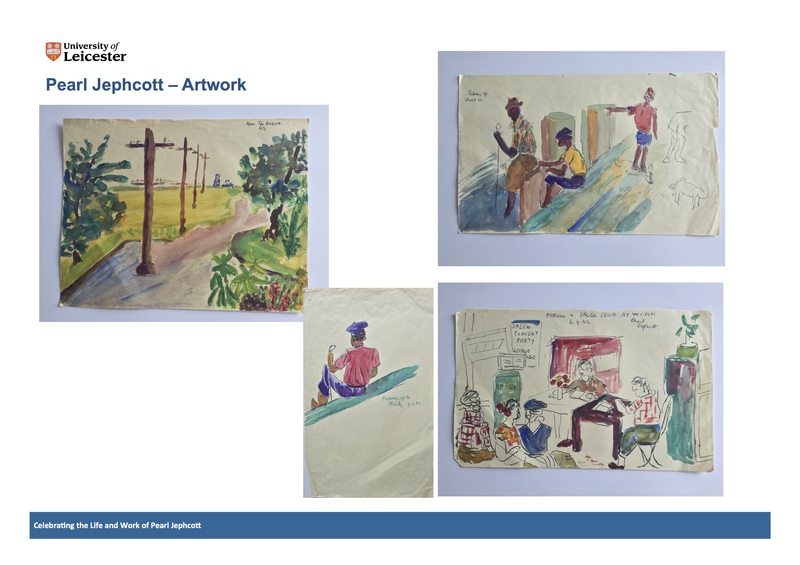 The Australia notebook reveals Jephcott to be an exceptional sociologist who, epitomising the ‘craft’ advocated by Mills, methodically and richly documented her visit via notes, original artwork, clippings and postcards. Detailed personal research ephemera that offer insights into Pearl’s sociology that could not have been ascertained from any formally archived materials. Pearl Jephcott (1900-1980): The ‘Czechoslovakia’ Notebook: A central feature of sociological practice is to continually record the things we encounter, hear and observe to stimulate our sociological imagination. Pearl Jephcott was an exceptional sociologist who epitomised this ‘craft’. Now largely forgotten, a reanalysis of her richly detailed notebooks is essential if we are to both fully understand her contribution to the discipline and to bring her unique sociological contribution back into view. These notebooks, alongside others forms of marginalia and research ephemera, so often overlooked, reveal much about the history of the discipline and those who have contributed to it. Who is Pearl Jephcott? A forgotten independent sociologist, that’s who! 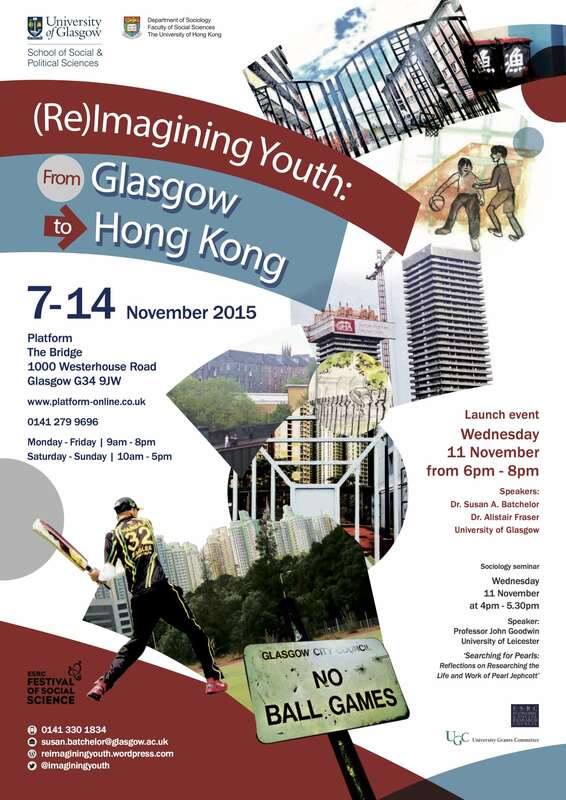 Pearl Jephcott was a radical youth worker who was made redundant in the 1940s and became a sociologist and researcher who studied everyday topics like women’s work, young people’s leisure, Notting Hill and what it is like living in the new high rise flats in Glasgow. She used what we may term innovative or creative research methods like diaries, children’s drawings, participatory action research, ethnography, mixed methods and so on. She died in 1980 at the age of 80 with sociologist as her occupation on her death certificate. However, she was an accidental sociologist and did it only because of her redundancy, says Tony Jeffs who was one of the many speakers and Jephcott fans speaking at a symposium about her life and work at the University of Leicester on 9th July. Artwork courtesy of the estate of Pearl Jephcott. Digital images: John Goodwin, University of Leicester. Trying to find a single word that best encapsulates the research that Pearl Jephcott undertook, and her research ‘style’, has been quite hard. Variously we have described it as ‘innovative’ and even ‘Millsian’. However neither of these terms do the work justice. Pearl’s work is, of course, innovative and she was a methodological innovator in the true sense of the word. She used a wide range of methods within and across her various research projects seemingly testing, adapting and refining as she went along. If one method did not work she moved onto the next. Yet innovation is only one aspect. Millsian does not quite do it either. We have used Millsian as Pearl, as Mills advocates in The Sociological Imagination (1958) ‘kept files’ and her archived materials are as detailed as they are extensive. We have also argued in this blog that her work was ‘Millsian’ in the sense through her research ‘speak the politics of truth to power’ (see Mills 2008[c1944]). Jephcott’s concerns were fundamentally for the individuals who she had researched and portrayed in her writings. Yet again these are only aspects of her research. More broadly it is impossible to delineate Pearl’s work tightly in terms of ‘theme’ – she writes about youth but is not a youth studies scholar in the strict sense of word. She cannot be confined to a single thematic strand as she had such a wide range of interests and preoccupations. 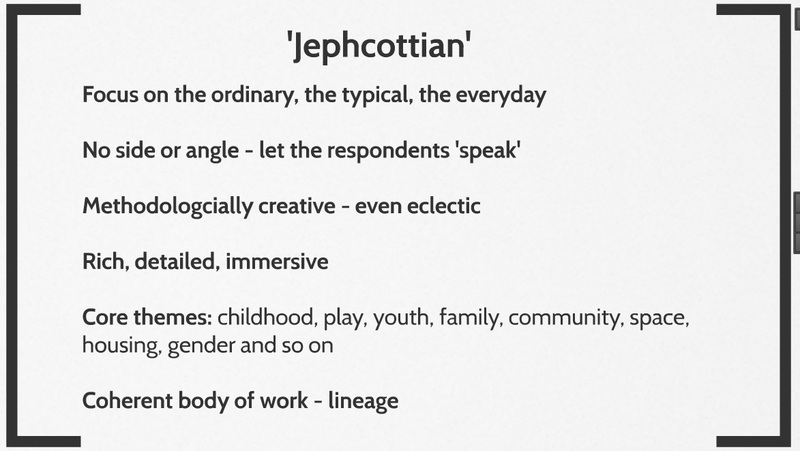 So we came up with JEPHCOTTIAN – the features of which we outline in the slide below and which seem central to her sociological pratice.